Skeletons have come rushing out of the closet in the aftermath of the enormous Ashley Madison data breach. With 37 million users suddenly finding their email addresses and exchanges compromised, once private records of infidelity are now out in the public domain, and in some states, a greater proportion of individuals have cause for some serious concern. Thanks to data released exclusively to Digital Trends from Trustify, the search engine that allows you to determine whether you’re on the list of alleged cheaters, we now know where Ashley Madison was particularly virulent, and just how much money was really spent on digital infidelity in the United States. We also know that only 6 percent of paid users were women. 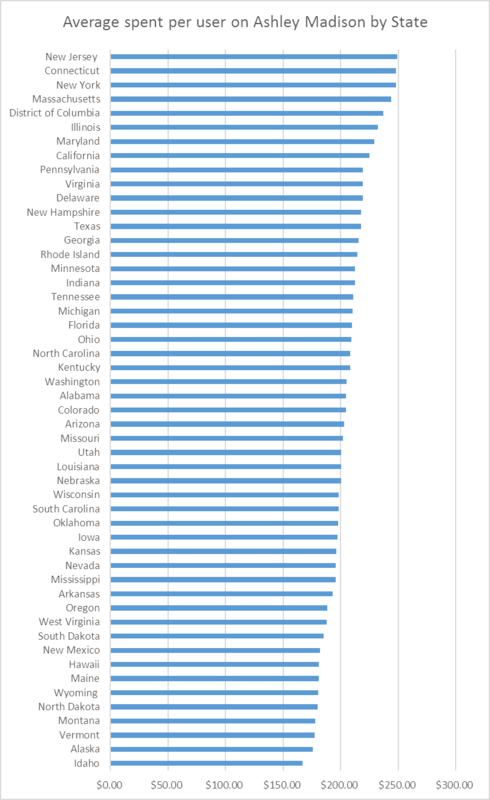 In terms of raw user numbers, the most populous states in the U.S. contained the most Ashley Madison users. In California, the nation’s biggest state in terms of number of inhabitants, 135,796 individuals were paying members of Ashley Madison. Texas and New York followed, with 95,603 and 80,541 paying members, respectively. While Florida recently surpassed New York to be the third most populous state, it had fewer paying Ashley Madison customers, coming in fourth with 65,360 accounts. Far more interesting is the comparison of the number of Ashley Madison users to the total state population. When this proportion is taken into account, it is in fact the nation’s capital that boasts the greatest percentage of Ashley Madison subscribers, with 0.55 percent of the district’s population of 658,893 paying for accounts with the cheating site. While this may not seem like a significant number, this does suggest that one in every 200 denizens of Washington, DC paid for the Ashley Madison service. And given that DC’s population is comprised greatly by the men and women who run our country, the implications for our top-down moral code are questionable. 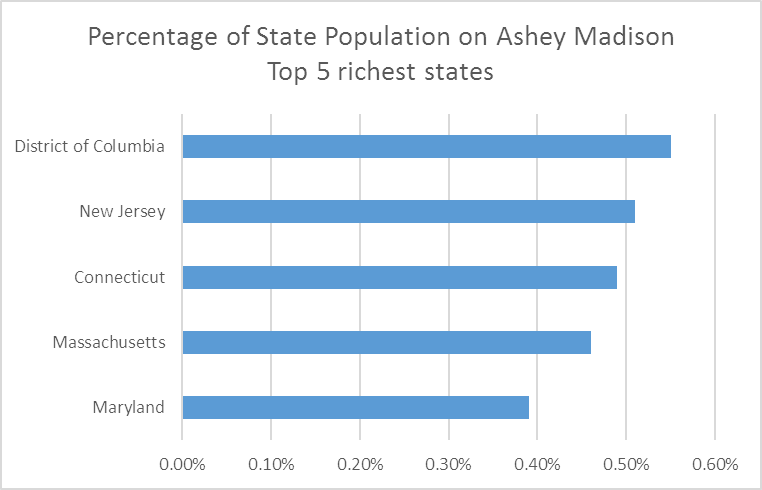 As a matter of fact, the top five states in terms of the relative proportion of Ashley Madison users to populations are all located in the northeast of the United States. Conversely, in the more stereotypically socially conservative south and midwest (truly, the Bible Belt of the country), a much smaller percentage of inhabitants were using the site. 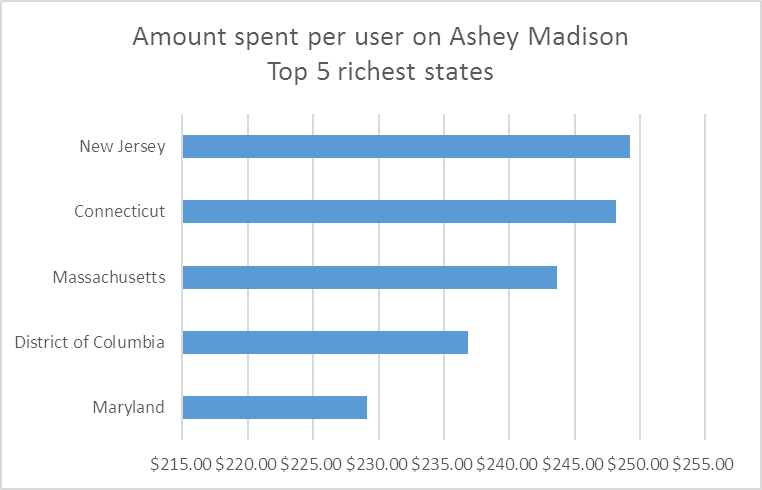 New Jersey, Connecticut, New Hampshire, and Massachusetts join Washington, DC as the most unfaithful states in the U.S., with 0.51, 0.49, 0.47, and 0.46 percent of their populations, respectively, paying to be on Ashley Madison. Most faithful (or at least, absent from Ashley Madison), were West Virginia, Mississippi, Arkansas, Kentucky, and Alabama, each of which had less than 0.25 percent of their inhabitants on the site. Even more interesting, however, is the average amount of money users spent on Ashley Madison. All told, American users dropped a whopping $236,297,470.50 on cuckolding their spouses by way of the Internet, and New Jersey takes the cake once again in terms of the average dollar amount spent per user at just over $249. Nationally, the average is just $218.08, which means that New Jersey residents are shelling out significantly more to feed their interest. While New York missed the top five list when it came to proportional user base, the high roller attitude of the Big Apple manifests itself in a willingness to drop a couple hundred dollars to cheat on significant others. On average, New York Ashley Madison users spent $247.95 on the site. The cheapest cheaters? They live in Illinois, where the average amount spent was merely $166.99, nearly $10 less than their closest competitor, Arkansas. So what does all this tell us? Well for one thing, DC’s sordid history with its political scandals grows grimier still with the Ashley Madison leak. Not only does the district rank highest in terms of its proportion of users, it also ranks in the top five when it comes to average amount of money spent and average transactions per user (only four states, including Connecticut, Massachusetts, and New York averaged more than four transactions per person). 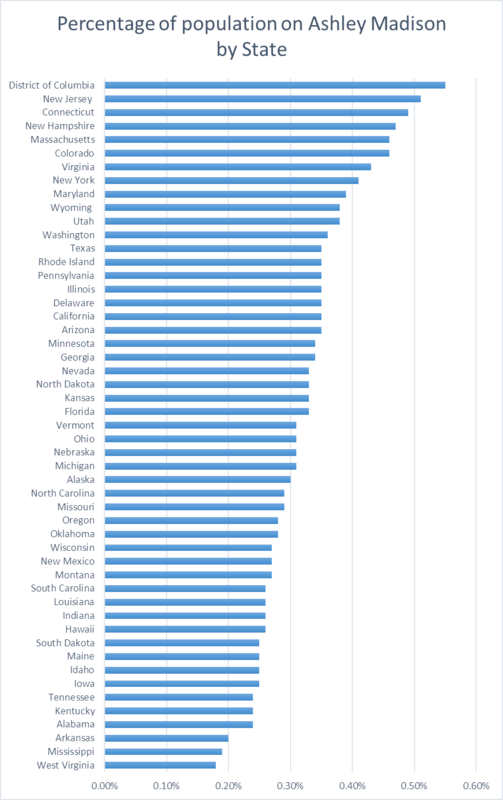 Moreover, it is the country’s richest states that are also the most prone to infidelity — in 2014, DC and New Jersey were ranked the wealthiest in terms of income, GDP per capita, and tax dollars per capita. 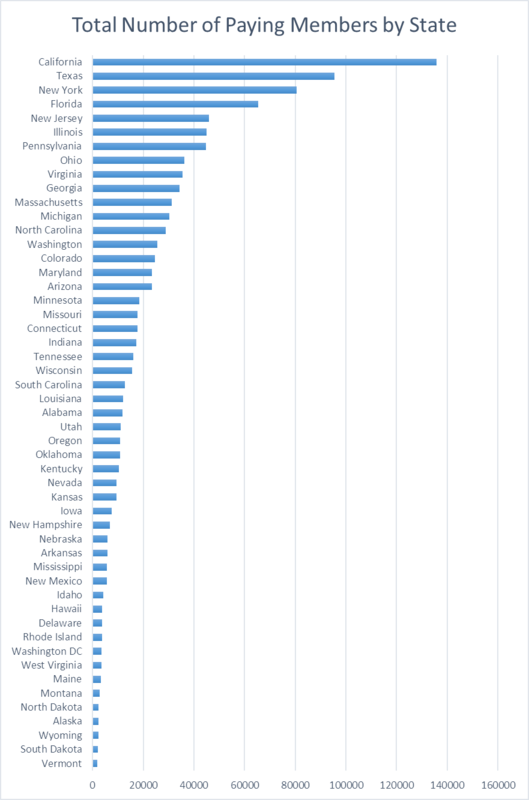 Connecticut, Maryland, and Massachusetts rounded out the top five. So sure, money doesn’t buy you happiness. But it can buy you adultery. That is, if Ashley Madison users really got what they paid for at all — at least, until it all came crashing down.